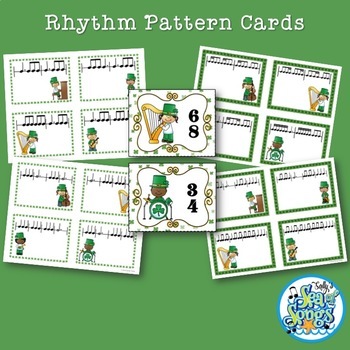 Whether you use the group games, write-the-room worksheets, or the music center activities, Leprechaun Rhythm Pattern Cards are the perfect addition to your St. Patrick's Day music lessons. 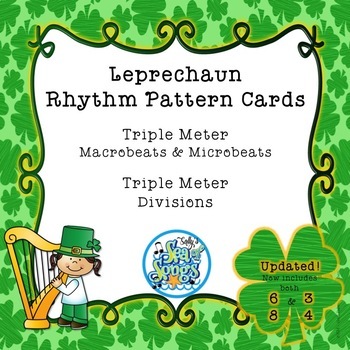 This product contains 2 Levels of Triple Rhythm Pattern cards: Level 1- Macrobeat/Microbeat Patterns and Level 2-Division Patterns. There are 8 cards in each level. 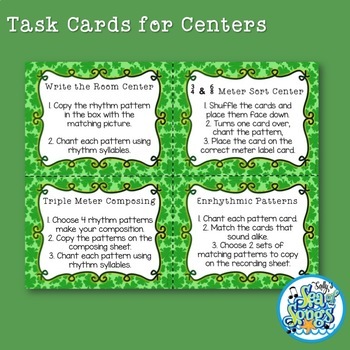 Now includes both 6/8 and 3/4 meter cards, center task cards, directions for 4 music centers, and 6 worksheets in addition to the whole group games listed below. Print out 1 level of pattern cards. Laminate if desired for greater durability. Spread cards around the floor, face up. Teacher sings a class favorite Irish song as students move around the room, stepping to the beat of the song. Everyone freeze when the music stops. The teacher claps or plays on hand drum one of the patterns. Students audiate the pattern, then look at the cards nearest to them on the floor to identify the teacher’s pattern, signaling if they see the pattern. For additional fun, give students a shamrock to use as a signal. Repeat process, singing song as students move around the classroom again. For best results, choose a song in triple meter such as Cockles & Mussels or Molly Malone. 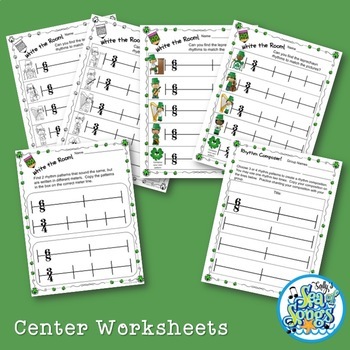 Print out enough sets of cards so each group of 3-4 children have a set. Students sit in a circle and spread cards on floor in the middle. The teacher claps or plays on hand drum one of the patterns. Students audiate the pattern, look at the cards and choose the card that matches the pattern that they are audiating. Turn the card over and continue the game with the teacher clapping or playing the next pattern. To add an additional degree of difficulty, ask groups to “translate” the pattern into rhythm syllables.